The installation of underground transmission lines costs more per foot than most overhead lines. Costs of underground construction can range from four to ten times as much as an equivalent length of overhead line. However, generalized cost ratios of underground to overhead options should not be used because costs are site-specific. A typical new 69 kV overhead single-circuit transmission line costs approximately $285,000 per mile as opposed to $1.5 million per mile (without the terminals) for a new 69 kV underground line. A new 138 kV overhead line costs approximately $390,000 per mile as opposed to $2 million per mile (without the terminals). A 2006 Virginia Joint Legislative Audit and Review Commission report estimated that constructing underground transmission lines ranges 4 to 10 times more expensive when compared to overhead lines of the same voltage. The cost of constructing underground transmission lines is determined by the local environment and the distances between splices and termination points. Other issues that make underground transmission lines more costly than overhead lines are right-of-way access and maintenance, construction limitations in urban areas, conflicts with other utilities, trenching construction issues, crossing natural or manmade barriers, and the potential need for forced cooling facilities. Repair costs for an underground line are usually greater than costs for an equivalent overhead line. Leaks can cost $50,000 to $100,000 to locate and repair. A leak detection system for a HPFF (High-pressure, fluid-filled pipe) cable system can cost from $1,000 to $400,000 to purchase and install depending on the system technology. Molded joints for splices in XLPE (Cross-linked polyethylene) line could cost about $20,000 to repair. Field-made splices could cost up to $60,000 to repair. A fault in a directionally drilled section of the line could require replacement of the entire section. For example, the cost for directional drilling an HPGF cables is $25 per foot per cable. The cables in the directional drilled section twist around each other in the pipe so they all would have to be pulled out for examination. Easement agreements may require the utility to compensate property owners for disruption in their property use and for property damage that is caused by repairing underground transmission lines on private property. However, the cost to compensate the landowner is small compared to the total repair costs. Underground transmission lines have higher life cycle costs than overhead transmission lines when combining construction, repair and maintenance costs over the life of the line. The impacts of underground transmission lines differ from those of overhead transmission lines during construction and afterwards. Underground lines generally cause greater soil disturbance due to trenching requirements, while overhead lines disturb the soil primarily at the location of the transmission poles. Trenching an underground line through farmlands, forests, wetlands, and other natural areas causes significant land disturbances. The ROW for underground transmission lines must be kept clear of trees and bushes, while small trees and bushes are allowed within the ROW under overhead lines. 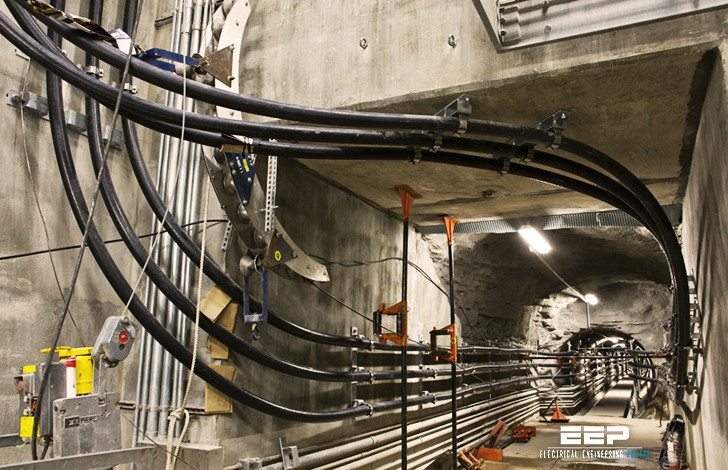 Post-construction issues such as aesthetics, concerns regarding electric and magnetic fields (EMF), and property values are usually less of an issue for underground lines. Underground lines are not visible after construction and have less impact on property values and aesthetics. I m final year student of electrical engineering. please tell me which is the highest voltage at which the underground distribution is carried out. As i know, 1200 kV is the highest voltage level for transmission of electrical energy.